Technology in computers these days are very favorable to the semi-knowledgeable hacker. We have TOR for anonymity online, we have SSDs to protect and securely delete our data—we can even boot an OS from a thumb drive or SD card. With a little tunneling and MAC spoofing, a decent hacker can easily go undetected and even make it look like someone else did the hack job. 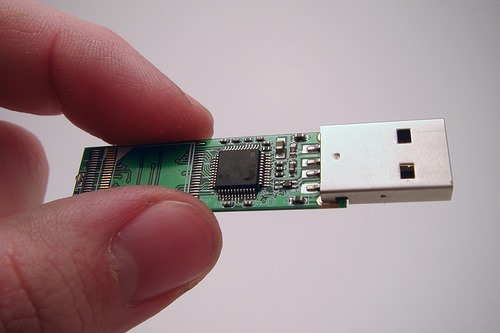 With a hacker's OS and all of their favorite tools on a tiny little thumb drive, the hacker's next precaution might be to conceal the thumb drive in some way, so the drive itself would look inconspicuous to authorities if they were ever somehow caught in a raid. Today's Byte demonstrates how you can take some household items and rip them apart to conceal your hacking OS inside. Let's assume that you only use this OS for legal bidding, shall we? Carefully crack open the case off your thumb drive and get the PCB out itself. This will reduce the size of the drive for when we put it in something later. Be careful not to break it! In this case, I'm picking the Chapstick to use as my item to hide the drive in. For this, I make sure the Chapstick is hollowed out, with just the outer casing and cap. Moldable epoxy is like a clay that you mold, but once it hardens around an object, it creates an incredibly strong adhesion that is very hard to break. We will use it to not only protect our thumb drive, but also make sure that it is properly sealed within the object housing that it is contained in. Take both sticks of epoxy "clay". Mold and knead them together for a good 10-15 minutes. Don't rub it on a table, it'll stick. Once the epoxy is blended well, mold a bit around the thumb drive (not too much!). Just enough to cover the surface area and electronic bits. 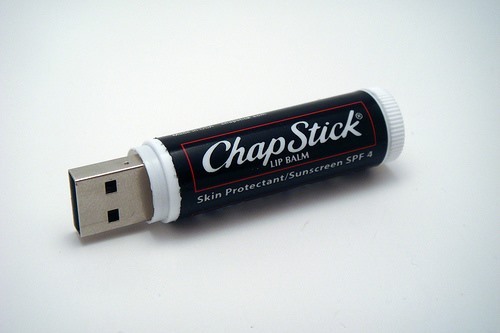 Now, put the thumb drive chip inside of the hollowed-out Chapstick container. Fill the rest of the container with epoxy. Remove the drive to fill with more epoxy, and fill slowly until you reach the perfect amount to make a good hold on it inside of the Chapstick. Wait a full day for the epoxy to dry. Test out your new capable USB Chap-drive! Now the Feds can't find your logs, because they are made of lip balm! "Now the Feds can't find your logs, because they are made of lip balm!" Where does it come out on the GBA case? Sounds cool ^_^. Pro tip: the usb drives with fancy rubber shapes usually have a full metallic cover to protect the memory and are easy to extract. Or you can use a 'nano' usb drive, which are easier to hide even without removing the outer case.